The Road to the Isles (A830) was the classic way to reach Skye via the ferry from Mallaig. It is also threaded by the famous railway with the iconic Glenfinnan Railway Viaduct. The road wends through highland glens and drops to the sea on and off on the journey which takes about 70 minutes non stop. But you will be stopping so this a wonderful day trip! You will pass through Glenfinnan and stop for both the Memorial and the viaduct. You can stop for a quick bite at the Dining Car Cafe at Glenfinnan Station (http://glenfinnanstationmuseum.co.uk/facilities/dining-car/) and browse the museum while you are there! There's not much else in the way of refreshment until you reah Lochailort where you stop for food and drink at Lochailort Inn ( http://www.lochailortinn.co.uk/) T: +44 (0)1687 470208. If you are looking for a wilder tour then come off onto the A861 for a drive along the north east of Ardnamuchan towards Glenuig. This is said to be the birthplace of Long John Silver, who worked on the construction of the nearby lighthouse at Barrahead, which happened to be one of many such lighthouses designed by the father of Robert Louis Stevenson. Silver met Robert Louis on a few occasions, and so impressed the young writer that he immortalized him in his classic novel Treasure Island. There are some nice beaches around, and the road west from the village out to the Rhue Peninsula is great for seal spotting. You can also take a cruise from Arisaig to the islands of Rùm, Eigg and Muck. Info - There are sailings daily Mon-Fri, and also Sat-Sun during the summer months. For details contact Arisaig Marine, Tel. 01687-450224. 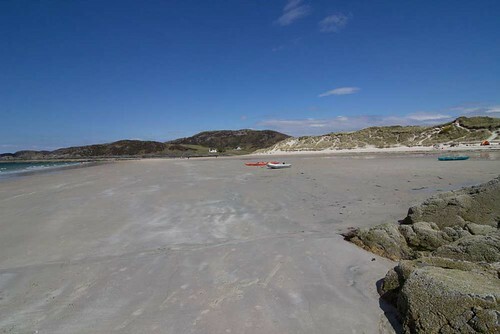 Between Arisaig and Morar is a string of glorious beaches of white sand backed by beautiful machair, washed by turquoise seas and enjoying magnificent views across to Rùm and the Cuillins of Skye. This is one of the most stunning stretches of coastline in Britain. Five miles north of Arisaig is Morar, and on the way you pass the silver sands of Camusdarach where the famous beach scenes from the movie Local Hero were filmed. This coastline gets very busy in summer but, like so much of the Highlands, it's easy to get away from it all. A single-track road leads up behind the village of Morar to dark, mysterious Loch Morar, the deepest inland loch in the country and home of Morag, Scotland's other, lesser-known monster. Two locals reported seeing her in August 1969 and a scientific investigation two years later uncovered a remarkable number of eye-witness accounts. You could always try to elicit further information from the locals over a wee dram in the bar of the Morar Hotel. The road runs along the north shore of the loch for three miles till it reaches the pretty little hamlets of Bracora and Bracorina. 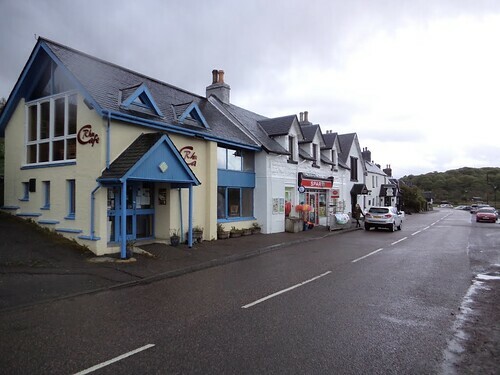 Here the road stops, but a footpath continues all the way to Tarbet on the shores of Loch Nevis, from where it's possible to catch a boat back to Mallaig (see below). It takes about three hours to walk to Tarbet (where there's now a bothy), and you'll need to get there by 1530 for the boat. Lovely white sanded beach between Morar and Arisaig with wonderful views across the sound to Skye. Beach in the film Local Hero. 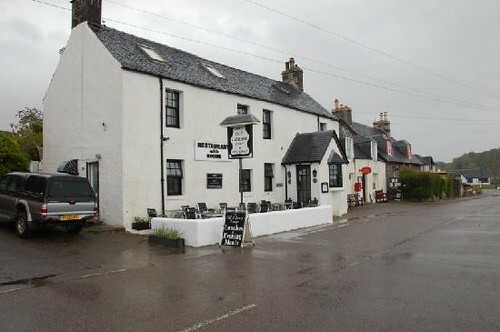 Restaurant in little village of Arisaig on the road to Mallaig serving bisto food. Also got some rooms. Arisaig has plenty of accommodation and a decent range of services. A good restaurant is The Old Library Lodge, Tel. 01687 450651, open Apr-Oct, which also has rooms. Detached cottage at Morar between Arisaig and Mallaig. Sleeps four people in two bedrooms.